Let’s talk about TIME and how to create more of it. Unless you’re Dr. Strange, time travel as we typically think of it is not possible. However, creating more time for yourself every day is very possible. This article is going to give everyone the power of the Time Stone. Quick disclaimer: This article is meant to help people who are not happy with their jobs or wish they had more personal time. If you truly love your job or you already have a career that gives you immense satisfaction, then you can skip this article. You’ve already hit the jackpot. Before we get started, here’s some woke comments I found on YouTube. The average American employee (sheeple) gets 2 weeks of vacation a year. If you’re lucky and you’ve shown loyalty to your company, you might get 3 weeks. Somebody with this type of limitation can realistically only take 1 or 2 actual vacations a year (outside of quick, weekend getaways). Many people will not even leave the country during their extended vacations because they not only appreciate the downtime at home, but they need it to take care of personal chores and responsibilities uninterrupted. There’s even a cute name for it : staycations. The desire to stay at home during a vacation is completely understandable when you’re always working, but this is truly a waste of your valuable vacation days (otherwise known as your “time off.”) Interestingly, the opposite of “time off” is “time on” which means your time is only considered on when you’re at work. There is no such thing as turning time on or off, there is only optimizing how you choose to spend the time that make you happiest. How many of us try to think of the best ways to maximize our limited vacation days? Do we use all of our days at once to get a super-long weekend? Or do we try to use them during national holidays to try to make those feel as long as possible? It’s a sick game of trying to juggle a finite resource that is limited even further by your job. An increase in me-time (such as taking vacations) is correlated to an increase in happiness. This article from Time backs me up. There’s 120 total hours during the weekdays. The typical work schedule is Monday – Friday, 9-5 daily. Most people have some sort of commute, and some like to wake up an hour before work to mentally prepare. This gives you a grand total of 3.5 hours (or 14.6%) of me-time each day. That’s not a lot of time. Throw in happy hours, dates, mandatory after-work events and you can see how quickly your entire week disappears. Add in hangovers and it makes the following day even more brutal. And I know many people in advertising who often work until midnight…just no. This drops me-time down to 0 and completely removes exercise. It’s a sick cycle of wake up, commute, work, sleep. When you have a 9-5 job, you are generally paid for your time and not for your productivity. A corporation is literally trading people’s limited time in exchange for money. Guess which is more valuable? By escaping the rat race (which trades money for some arbitrary fixed set of working hours), you can re-balance the scales and find or create a career that pays you based on productivity instead. Let your iPhone and laptop become your mobile office. This also can reduce your commute time down to 0. And if you want to push it even further, you can move to a country like Thailand where you can earn US-based income remotely against a significantly lower cost of living. Work less, get more. My friend told me she’s getting a 1-hour massage in New York City this week and it’s going to cost her $110. That’s the same price of ten 1-hour massages in Thailand. With tip! I feel happiest when I am free (me-time). 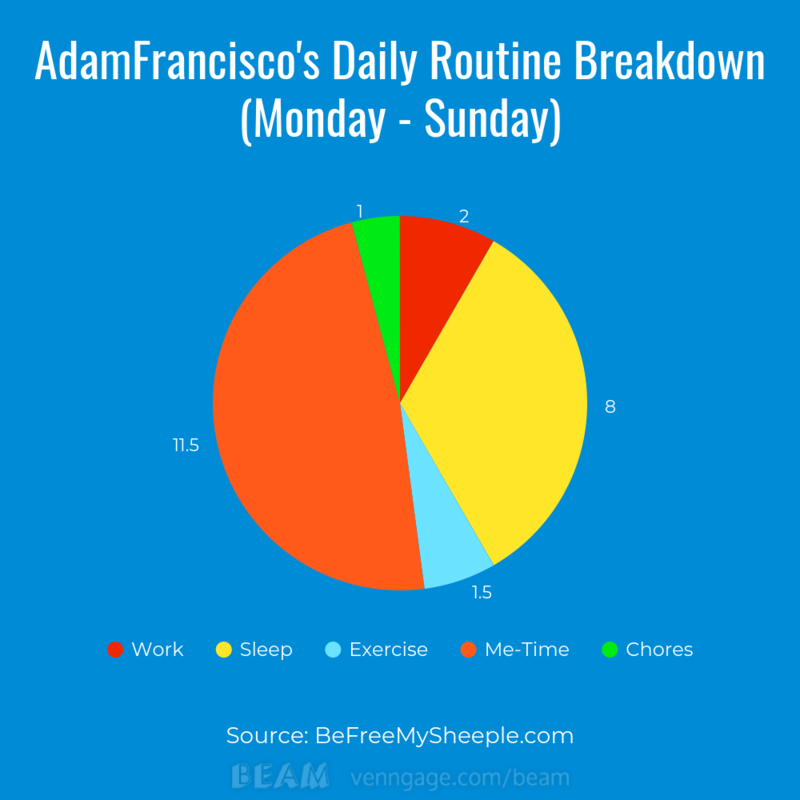 According to my Daily Routine Breakdown chart below, I am free for 11.5 hours a day, every day of the year. Over 365 days, that means I spend 4,197.5 hours in freedom. This comes out to 174 days, or 48% of the year. If we remove sleeping time, then I am enjoying freedom 72% of the time. 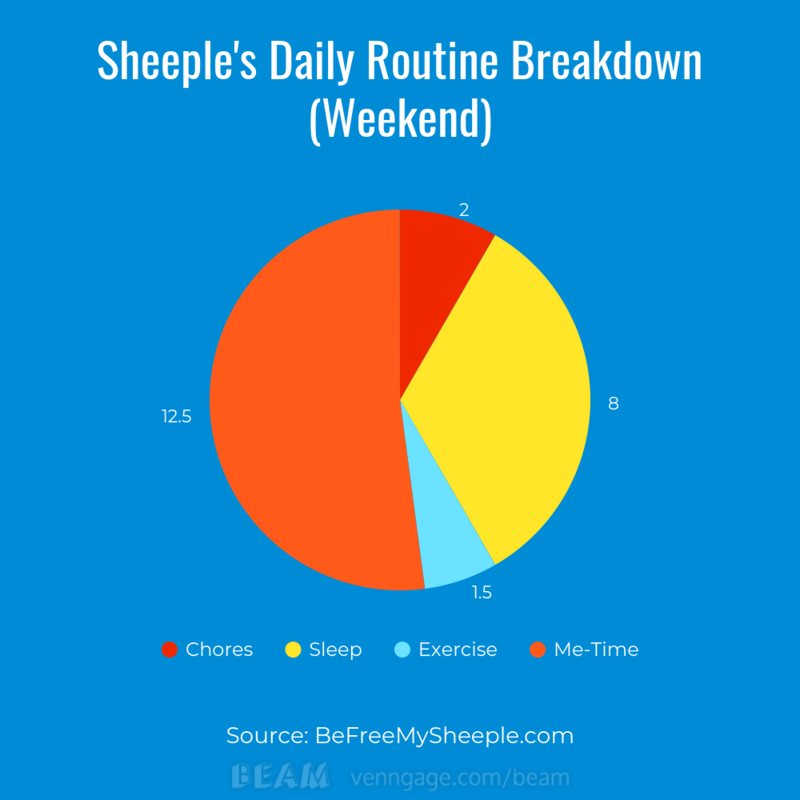 Compared to sheeple, they are free for 3.5 hours a day during the weekdays, and 12.5 hours a day during the weekend. Over 365 days, sheeple have 2,210 hours of freedom. This comes out to 25% of the year. 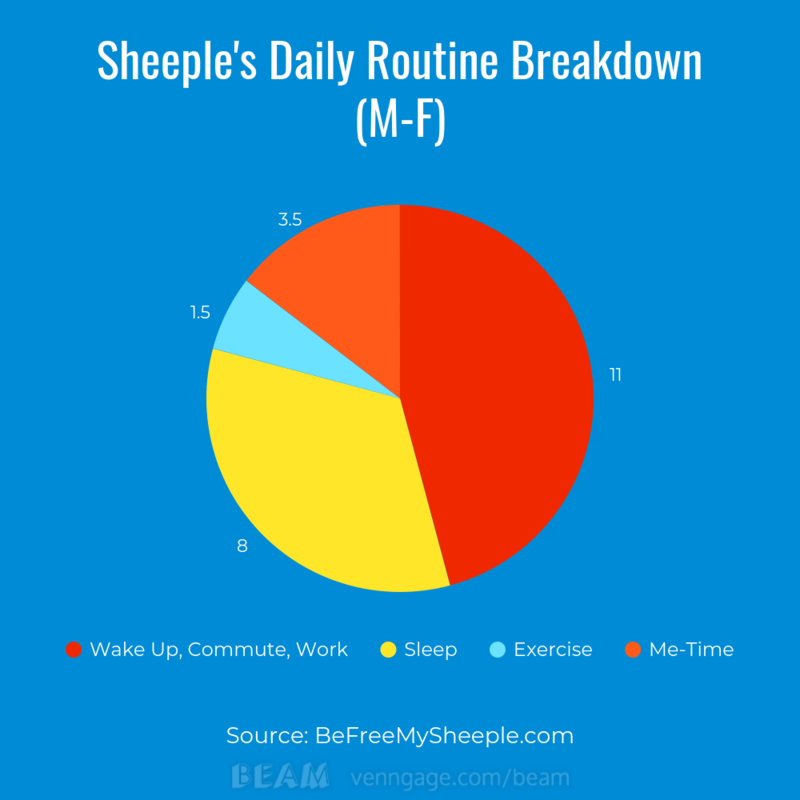 If we remove sleeping time, then sheeple are free 37% of the time. As you can see, I have found a way to almost double my freedom and thus, I’ve created more time. Factor this out across 10 years and you can essentially live 20 years in 10! 1. I wish I’d have the courage to live a life true to myself, not the life others expected of me. We should learn from our elders. 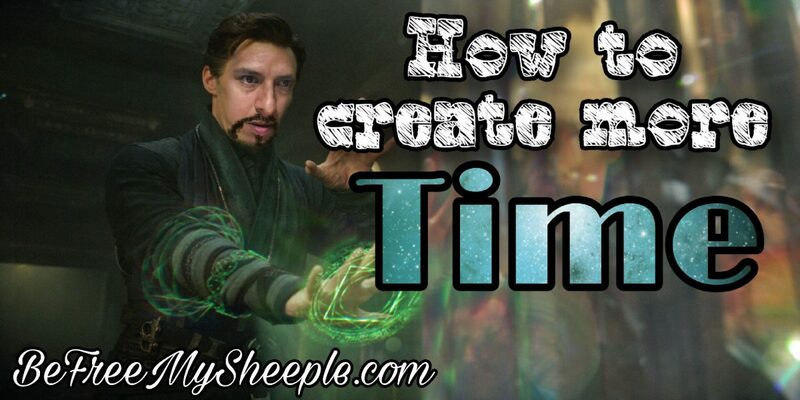 So How Do You Create More Time? As you can see, you don’t need a Time Stone or Dr. Strange’s powers to create more time. You just need some creativity, be willing to take a risk, and an open mind. Think about what your current company is paying you to do. And then think if your skillset can translate to a career off of your phone or laptop. Some of you might have jobs that require you to be on-location such as a doctor or nurse. But if traveling more is something you wanted, there’s always jobs like traveling nurses (this is a huge industry). There’s always a way to improve or obtain whatever it is that you think is lacking in your life, regardless of your career. Always respect yourself. If your company is taking advantage of you or not paying you what you feel you deserve, do not show them loyalty. If the company was struggling, they would have no hesitation in laying you off. I’ve seen it happen to close friends and good people. Consider living in a more affordable country while earning income remotely. Work less, get more. If you’re in the rat race for the foreseeable future, make as much money as you possibly can, as quickly as you can and invest. Do not buy a Prada bag or the new Jordans if you do not yet have a healthy portfolio or real estate investments. Only spend your money on things that will grow your money. “Make your money move.” Your money can literally quadruple in 10 years. If money is limited and you feel like splurging, I recommend splurging on experiences over appearances. Invest in a trip, not an expensive clothing item. The clothing item will surely go down in value but your experiences will never be forgotten. To end this article, I want to leave you with 2 things. A beautifully-said post by my friend Tara Atwood and one of my favorite shorts, Rat Race. How are you going to create more time? Leave a comment or you can e-mail me adam@befreemysheeple.com. If you enjoyed reading/watching this, you can follow me on Instagram, @adamfrancisco & @befreemysheeple. Great post. 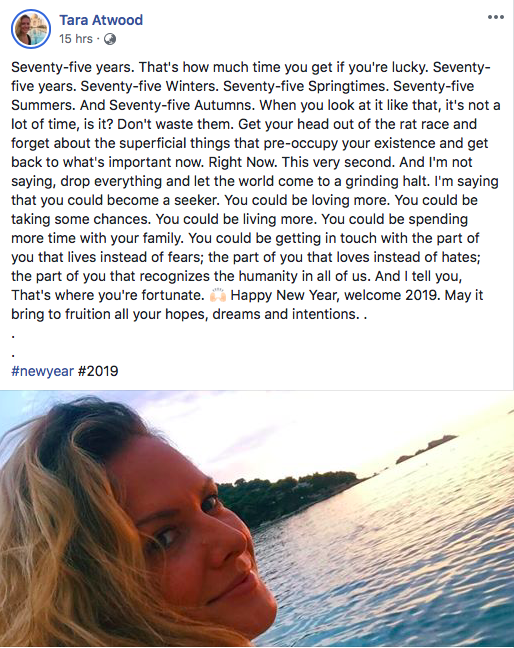 As a mom, kinda hard to wrap my head around implementing with the demands of family, but definilty some great points to get more out of life. Well done!!! I think as a parent there are certainly other priorities such as being financially stable to support your family, but I still think even within that structure, you can always find a job that is more flexible to the needs of a parent. Might take some extra looking but there is usually a better opportunity if you need one!